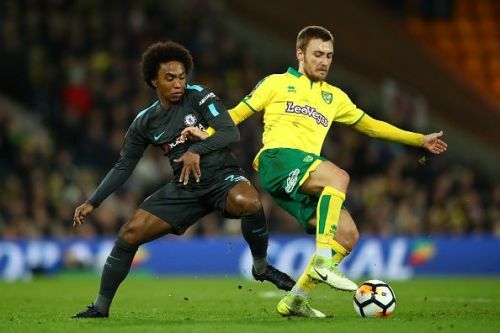 Antonio Conte's Chelsea were held to a disappointing 0-0 draw in the FA Cup third round fixture against Norwich City at Carrow Road. The Blues failed to create any significant trouble to the hosts in the first half and gave the ball away too easily on countless occasions. Norwich, on the other hand, continued to look comfortable with the ball and even created a few opportunities for themselves. Daniel Farke's side forced the issue on the Champions of England and earned themselves a replay at Stamford Bridge next week, to add to Chelsea's already congested fixture pile-up this month. Gunn enjoyed a relatively easy outing in goal for the hosts, thanks to Chelsea's inability to make things happen inside Norwich's final third. However, he was forced to make a few saves in the second half and lived up to the task. The skipper was part of a defence that never looked like conceding a goal on the night. Pinto managed to keep the likes of Pedro and Kenedy very quiet in the first half. A commanding performance nonetheless. Deployed in the heart of the defence, Zimmerman produced a scintillating performance for Farke's side. The German rallied his troops with discipline and showed great awareness throughout the game. He was comfortable in possession and never looked like putting a foot wrong. Hanley also enjoyed a decent outing against the Premier League champions and stood his ground against the likes of Willian and Pedro. The defender was confident on the ball and tried to play it forward on numerous instances. The former Wolfsburg man was the last piece in the hosts' resolute back three on the night and contributed massively to his side's shape at the back. Klose made full use of his experience and stayed alert throughout the duration of the game. The 19-year-old put in a stellar performance at left wing-back for the hosts and showed great awareness for his age. Lewis managed to do well in one-vs-one situations against Davide Zappacosta and bombed forward whenever he sensed an opportunity. Tettey looked comfortable in the middle of the park and looked very easy on the eye with the ball in his feet. The midfielder was equally good without it in the second half and managed to stay in the game till the final whistle. The German partnered Tettey in midfield and together they proved to be a handful for Tiemoue Bakayoko. Trybull was always looking to turn defence into attack and impressed with his crisp short passing that helped Norwich keep the ball better in the first half. Pritchard was a constant thorn for the Chelsea defenders and he created a lot of tension among the visitors due to his driving runs and quick movement with the ball. The former Spurs midfielder showed his class on the night and proved to be a handful for the likes of Cahill and Luiz. 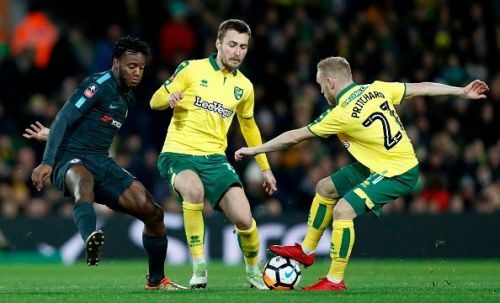 The 21-year-old continues to impress for Norwich and put on a show for the home supporters with his direct approach to the game. 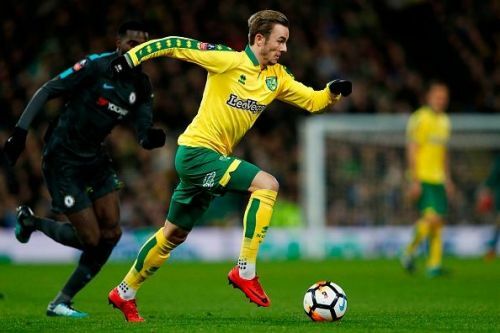 Maddison ran tirelessly throughout the night and was not shy of taking on his opponents on his own, causing all kinds of headaches to the Chelsea defence. The tricky winger made it very difficult for Antonio Rudiger on the night and the frustration was there to see for everyone. Murphy combined well with Pritchard and Maddison to stretch Chelsea at the back and with a little bit of luck, he could have even grabbed the headlines. Came on in the 83rd minute to replace Josh Murphy and couldn't influence much. Came on in the 87th minute to replace Alex Pritchard, and was too late to affect the game.